Ramos fouls Salah during Saturday's Champions League final. 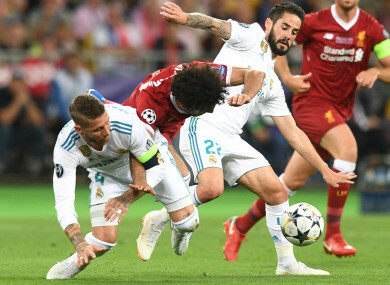 LIVERPOOL MANAGER JURGEN Klopp compared Sergio Ramos’ challenge on Mohamed Salah that injured the star attacker in the Champions League final to wrestling. Salah came off in tears half an hour into Liverpool’s 3-1 loss to Real Madrid in Kiev on Saturday after hurting his shoulder under a challenge from Ramos, who later wished the Egypt international a speedy recovery. “Congratulations to Real Madrid, [it's] not to forget they won the Champions League. Of course it was a big moment in the game,” the German told a news conference. “I know if you say something like that after a game you lost, it sounds like you are a little bit a bad loser but it was, for me, kind of a harsh challenge. Liverpool had made a bright start to the encounter, but Madrid took over after Salah came off, with Gareth Bale’s brace – after Sadio Mane had cancelled out Karim Benzema’s opener – the difference. Klopp acknowledged the Egypt international’s injury had allowed Madrid to take control, while he lamented the way his team conceded as goalkeeper Loris Karius endured a nightmare outing. “The shock of the boys was obvious, we dropped a little bit deep and Real tried to use that for positive momentum, until we settled a little bit,” he said. “It was quite difficult but 0-0 at half-time, we could adjust a few things – defending half-spaces, which we did before that really well, and then playing more football. “And then the other decisive moments were the goals; they were quite strange, that’s how it is. Email “'It was like wrestling' – Klopp unhappy with Ramos challenge on Salah”. Feedback on “'It was like wrestling' – Klopp unhappy with Ramos challenge on Salah”.